Great compilation you’ve got there! I had referred previously a number of times to your LocalEze and ExpressUpdate categories lists and they’ve both proven to be very useful. All in all, it is really great to have all this at the same place. Handy lists. Any ideas how to get categories added to these sites? It really is ridiculous that we live in a day of technology and change every day yet no new categories are ever added. It’s been like 15 years now that there are garage storage and organization people for instance. They don’t build garages, they don’t organize other parts of the home, nor repair garage doors, they don’t build closets or cabinets for the kitchen. Just one example. Seems like the move to no custom categories should warrant a punch in the face to Google. Not like there is a place to submit new category ideas. Hey but our next best option is to use these lists so thanks for sharing. I agree. It’s a shame that what you see is pretty much what you get. In particular, that’s been my gripe with Google’s categories, ever since I learned the custom categories are going away. Hey thanks Phil for trying to ease the pain. Once again you’ve gone above and beyond in creating an extremely helpful resource! This will really speed up citation building for clients with uncommon services! What tips do you have for people to find the best possible category for an uncommon business? 1. Scour all your category options and pick the closest-fitting ones. 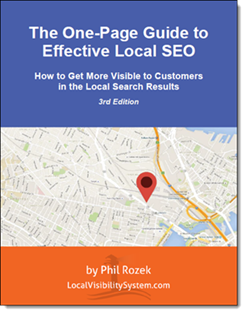 Doing this on your Google+ Local listing is just the beginning; of course, you’ll also want to scour the category lists of the other sites I mentioned. 2. Take the time to fill in the “keywords,” “services,” or “tags” (or similarly named) fields on all your listings, as permitted. I’ve seen Google scrape those fields and haul them into the MapMaker categories record (which you can see if you go to any given Google listing and click the “Edit details” link). 3. Have a landing page for each specific service you offer / category your business falls into. I suggest doing this anyway, because it’s worth trying to snag local-organic rankings wherever possible – especially for more-specific, potentially longer-tail search terms, because the people who type those into Google might be pretty far along in the buying process. By the way, I really like the post you just did on citation sources. Thanks Phil for the amazing response! Really appreciate it the advice. Also glad you liked my citation strategy post, hoped it gave you some fresh ideas. Yeah, you’ve some great stuff in there, Benjamin. I am an account manager that is trying to help some of my co-workers in our small office here in Tenn. I am interested in learning about the category/keyword restrictions on marijuana dispensaries. Your advice and links are the only ones that have helped me in my search thus far so I figured I would ask. Any advice or help with this matter wil be greatly appreciated. Good question, Heather. That’s uncharted territory. Thank you so much for answering my question in such a timely manner. I am very interested in learning more about the opportunities this new law has in store for online advertising. I understand mass media marketing isn’t being allowed at this point, but I have seen Google+ Pages w/ pictures of cannabis and I know from the tools I use at work that their listings are being picked up by Yahoo, Yelp, Google .. I haven’t found one on Bing yet, but I could be mistaken. The only categories I’ve come across have been Doctors, Pharmacy, and Clinics. I’ve only researched four as of yesterday/this morning. Again, thank you and I hope to hear from anyone who knows more about this! OK. Thank you Phil. What about programs that work them up on Google etc. through basic SEO like having their NAP synchronized? Do you believe that would benefit these retailers and clinics? I’m not sure what you mean, Heather. Feel free to break that down for me a little. Sorry, I guess what I mean is “Would these centers benefit from any kind of online programs right now?” I know a lot is a gray area, but what about basic SEO – Name, Address and Phone# There are over 380 of them in Denver alone and nearly 150 in Boulder. I partner with the Google Display network – but we have very simple, inexpensive Local Seaarch programs in place as well. I just am a little skittish about it because I handle attorneys in a few different states. I know after learning the ends and outs of the “legalities” of their banners that this is not as cut n dry as people think. I suppose I just need to wait and see what unfolds for them. Sorry for the confusion. No idea of Google’s PPC policies toward dispensaries. But yeah, I think at the very least you should try to work on the citations where appropriate. Amazing post Phil. This is a fantastic resource for me. Thank you so much for the hard work. Any plans to fix the Bing list? it’s a bit messy! I mean, it’s really hard to find main categories, sub-categories, etc. It’s just meant to be a quick reference. As I recall, I just went the brute-force route: expanded all the dropdowns in Bing’s “categories” area, then copied and pasted a page of categories at a time. Feel free to take the unrefined list (the one in the blog post) and take it in a different direction!